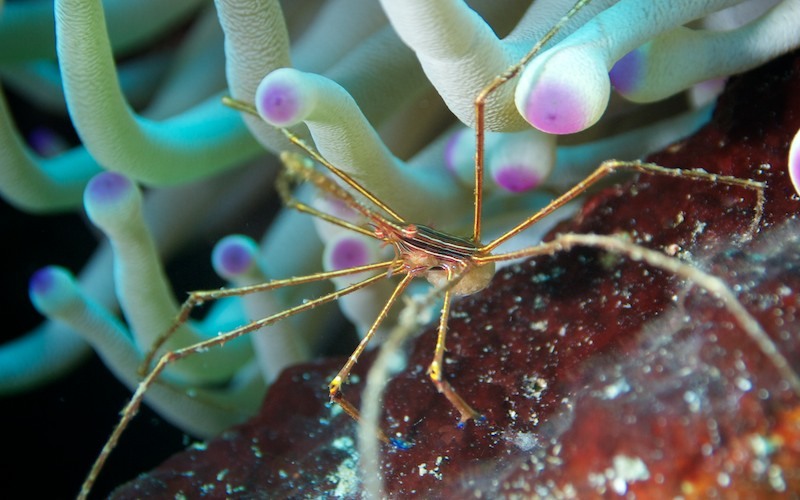 Caption: Stenorhynchus seticornis, the yellowline arrow crab or simply arrow crab, is a species of marine crab. The body of S. seticornis is triangular, and the rostrum is drawn out into a long point with serrate edges. The legs are also long and thin, up to 10 cm (3.9 in) across, and the animal's carapace may be up to 6 cm (2.4 in) long. Colouration is variable in this species; the body may be golden, yellow or cream, marked with brown, black or iridescent-blue lines; the legs are reddish or yellow, and the claws are blue or violet.